'Sable three Piles Or on a Base enarched Vert fimbriated Or a Fountain and for the Crest On a Wreath Or and Vert A Piece of Blue John Stone proper within a Chevron Sable And We do further grant and assign the following Device or Badge that is to say: A Fountain within a Triangle Sable And by the Authority aforesaid I the said Garter do by these Presents further grant and assign unto the Council of the Borough of High Peak the Supporters following that is to say: On either side a Stag Or attired and unguled Sable gorged with a Mural Crown Vert and resting the interior hind leg on a piece of Blue John Stone proper, as the same are all in the margin hereof more plainly depicted the whole to be borne and used for ever hereafter by the Council of the Borough of High Peak on its Common Seal or otherwise according to the Laws of Arms'. The design is based on two major premises. The first is that it should symbolise the whole new district and not try to include bits and pieces from all the obsolete constituent authorities. The second is that it should be dignified, simple, symmetrical, memorable, relatively economic to reproduce in colour and capable of reduction without great loss of detail. The black points represent the high peaks in the north of the district, whilst the green base symbolises the green lowlands and the heraldic fountain (a device used to represent enclosed areas of water) refers to the lakes and reservoirs and natural mineral springs. The symbols suggest the topography of the district rather than any particular occupations, trades or industries. This continues the peak motif of the arms, but here this is a single peak at the highest point in the achievement of arms, being a specific reference to the name of the district. In a cave within the peak is a piece of Blue John, this being a special feature of the district and known throughout the world. The stag or buck is found everywhere in the heraldry of the entire district. The stags represent the Cavendish stag, the stag of Downes, Lords of the Manor of Whaley Bridge, the buck of Buxton, and the stags which once roamed over the whole area. "Consilio Semper Publico" (Ever in the public interest). "Vert, the Rod of Aesculapius or, within an orle of eight fountains; and for the Crest, on a wreath of the colours (gold and green) upon a rock a buck at gaze proper. Mantled vert, doubled or." Upon a green shield, the colour of which has reference to Buxton's beautiful situation among the Derbyshire hills, appears the Rod of Aesculapius, son of Apollo in Greek mythology and god of the healing art, between eight heraldic fountains. These "charges" and the motto "Benedicte fontes Domino" (O, ye fountains, bless ye the Lord) refer to the medicinal springs for which Buxton is famous. The crest of a buck upon a rock (buck-stone) suggests the name of Buxton. 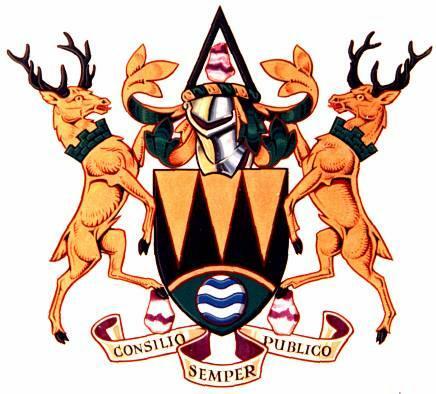 The buck also has reference to the Dukes of Devonshire, who have greatly aided the development of the Borough, two bucks being the supporters of their heraldic arms. "Argent a Rose Gules barbed and seeded proper between three Cross crosslets fitchee and in chief a Mural Crown". The red rose in the design represents the connection of Glossop with the Duchy of Lancaster, the cross crosslets are from the Arms of the Dukes of Norfolk, Lords of the Manor, and the Crown is the Mural Crown symbolical of the former Borough of Glossop. The motto "Virtus, Veritas, Libertas" is the Corporation's own motto and can be freely translated as "Courage, Truth and Freedom".